“Bekhten’s Curse”, the new video from French technical metallers GOROD, can be seen below. The song is taken from the band’s latest album, “Aethra”, which was released today (Friday, October 19) via Overpowered Records. The clip was produced by Disclosure Productions. 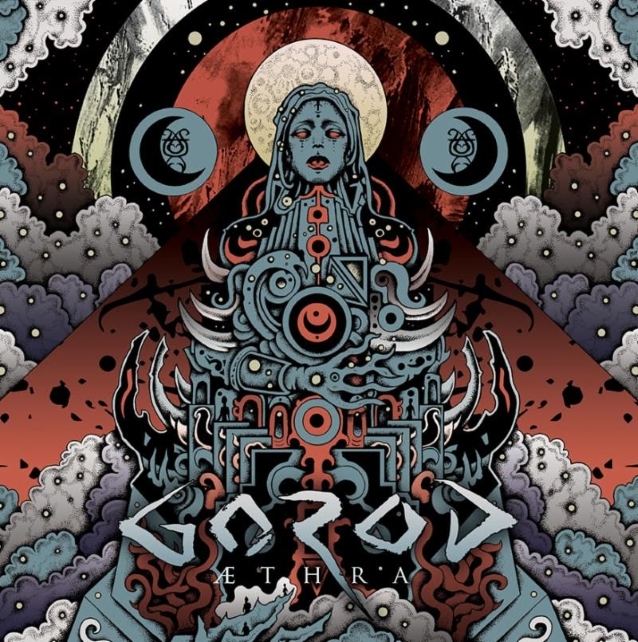 The 10th release from GOROD was produced and recorded by GOROD guitarist/mastermind Mathieu Pascal in his own Bud Studio, mixed at Dugout Studio by Daniel Bergstrand (MESHUGGAH, BEHEMOTH, DECAPITATED, IN FLAMES) and mastered by Lawrence Mackrory at Obey Mastering (DECAPITATED, NIGHTRAGE). With “Aethra”, GOROD transports the listener to a tragic and melancholic universe — a completely new level of darkness — while preserving what GOROD considers their tried and true core sound: incomparable groove, remarkable dexterity, and relentless technicality. But all the while, the band never sacrifices earworm hooks and unforgettable riffage. Deyres explains the concept behind “Aethra”: “The moon: a star, an allegory, a universal symbol that concerns all peoples and eras… this is the central theme of the lyrical concept of this album which is divided into ten texts that follow a form of parity in terms of genres: four titles are devoted to female lunar deities, four to male deities. The remaining two are respectively dealing with the universal symbolism of the owl and the star itself. As a live band through and through, GOROD plans to bring its trademark power and precision to North America on a full tour in support of “Aethra”. Before coming to the states, GOROD will tour in Europe with headliners BEYOND CREATION, as well as fellow support acts ENTHEOS and BROUGHT BY PAIN.